The game looks just as wacky as it did in alpha! 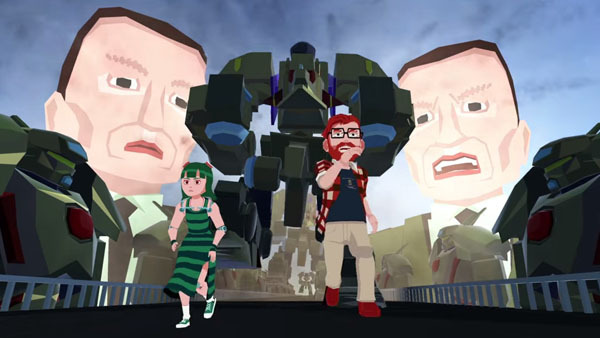 Ysbryd Games and Ackk Studios have released the official E3 2015 trailer for their upcoming game YIIK, a "postmodern RPG." It's headed for multiple consoles, but most importantly here for Modojo readers, it will be releasing on the PS Vita. And that's great news, especially given the fact that it really lends itself to the portable repertoire that the Vita prides itself on collecting. The game itself is an interesting mixture of strangers, a woman who disappears in an elevator, and a weird website where people gather to discuss conspiracies and other odd business. Having played the game during its alpha stage on PC, I can attest that its roots are well mired in that of Earthbound and other similar RPGs with plenty of bizarre goings-on within. It's colorful and quirky too, and had previously adopted an anime art style to accompany its characters. I'm happy to see this has changed in the interim. The game will be releasing in its finished form this winter. I'll have more on it then when I'm able to give it a try.